First, be aware that the MA degree qualifies you to apply to most full-time junior college/community college professorships, and to adjunct (i.e. teach part-time) at most senior/4-year colleges. I say “most” because though I’ve never encountered a situation where the MA didn’t qualify you for these things, I’m sure that there are some exceptions somewhere out there in the world. In most cases though you’ll see in want-ads that community colleges require the MA in English for English professorships, same for senior college adjunct pools. 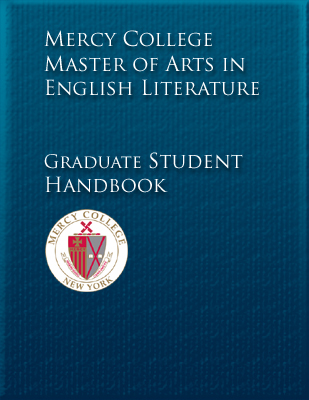 To apply to full-time English professorships at senior/4-year colleges, the terminal degree, meaning the PhD, is required; except, upon occasion, for creative writing positions for which the MFA is sometimes considered the terminal degree. Even that’s changing though. Side note: the term “adjunct pool” refers to the pool of adjunct professors any particular college keeps on file, and from which it draws teachers each semester to staff many of its courses. Few institutions have enough full-time faculty to staff all their courses, and so most institutions rely (sometimes heavily) on adjunct professors to teach a significant portion of courses each semester. Some people adjunct to gain experience for when applying to full-time positions or PhD programs; some do it to provide a stimulating supplement to some other job they might hold; some do it as a secondary income source for a household; and some actually adjunct “full time” by which I mean they put themselves into multiple institutions’ adjunct pools and so weave together a full-time schedule each year teaching across different colleges. So, where does one even begin to search for any of these teaching positions? The most popular and common job site is probably the Chronicle of Higher Ed. The Chronicle is the most popular news source for college academia, and maintains a popular job-board which I’ve linked there. Another popular site is Higher Ed Jobs. Both of those sites are free to use, and have a variety of search features which allow you to rarify your search, including by geographical region. A third site is the Job information List of the MLA however be advised that this is a paid subscription site. Those are the big three national job boards. Additionally, all sorts of less centralized boards exist, and these you just have to discover by searching. For example California maintains the most brilliant example of a dedicated state-specific community college job board, the CCC Registry. And some institutions don’t necessarily post every job opening on the big national boards, but rather just post them on their Human Resources website (see for example Occidental College’s current faculty openings listed only on their HR site). Oftentimes calls for adjuncts will only be posted on a college’s HR site, and no-where else. Other local job boards exist, for example the California State Careers job board which lists all faculty openings in the Cal State system, some but not all of which are cross-listed on the national job boards. My examples are from California since that’s my old state, the one I know best, but the point is you should search the national job boards and also just do detective work and search around your state and local college websites to determine what more local job boards might exist near you. Always look for the Human Resources section of any college’s website; that’s almost always where they either list their job openings, or list a link to relevant job boards for their institution. Here’s a final way to go about the job search, particularly in terms of adjuncting: the cold call. Many institutions don’t even post want-ads for adjuncts on any board or even on their HR site because it’s relatively common practice for people interested in adjuncting to simply put together the paperwork (a cover letter and a curriculum vitae, which is not the same thing as a resume) and cold-call a department or program head (or whomever does the course staffing, which you’d want to determine beforehand through your detective work). It’s not inappropriate to approach, either in person or through email/phone, the staffing person of a dept./program and simply present yourself for consideration for future adjunct work. One last thing to explain is the annual hiring cycle. Full-time professorships for 4-year colleges typically post in the fall semester, starting in September. Community college professorships usually post in the spring semester, as early as January or February. Adjunct calls will post year round. Anomalous timing happens so it’s always good to keep an eye on the boards year-round if you’re in the job hunt. For example there’s often a small burst of job ads at the end of spring, early summer, which bespeak unsuccessful earlier searches they’re now trying to fill quickly prior to the start of the fall semester. Faculty positions almost always begin in whatever is the next/upcoming fall semester. I just want to congratulate each of you on the completion of another semester of graduate study, and on the completion of the 2014-15 school year here in the Mercy MA program. I hope that over the past year each of you has experienced something profound, read something fascinating and new, discussed something you’d never have discussed had you not been here together. I hope that each of you has experienced moments of awe, wonder, reflection, and epiphany over the course of the semester and school year. In the next week or two we’ll be announcing the Thesis of the Year award for 2014-15 theses projects, and we’ll soon be starting up the summer session for those of you who have decided to take a summer course or two. Some of your are gearing up for your final semester and your final 599 Thesis Tutorial course. If you’re at all unsure what you’re supposed to be doing for this, or when, check out the blog posts related to the Comp Exam and the Thesis Tutorial, and read up on those sections in the Graduate Student Handbook. As always, if you’ve got any questions just ask me at cloots@mercy.edu. To Sarah, Josh, and Nicole: it was great to see you walk the stage at commencement this year. I hope you heard me and the other MA English faculty clapping our little hearts out up on the faculty bandstand as you walked past. Sarah it was wonderful talking to you when you found me before the ceremony. 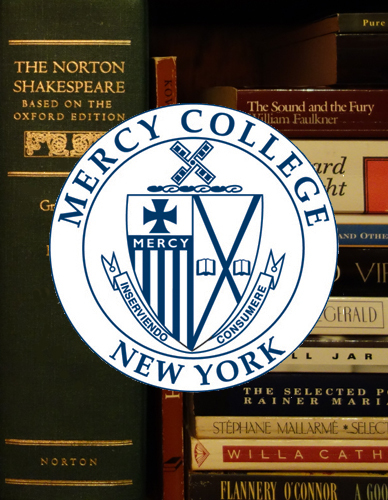 I’ll say to everyone what we talked about then: you are all a part of Mercy College, and you should always know that I and the faculty are here to help and guide you as best as we can, while you’re in the program and after. Don’t hesitate to contact me or other faculty with whom you’ve taken courses for advice or letters or recommendation or anything else of the sort. I hope each of you will take a moment now to congratulate yourself, treat yourself to something nice, here at the end of a year of graduate study and scholarship. 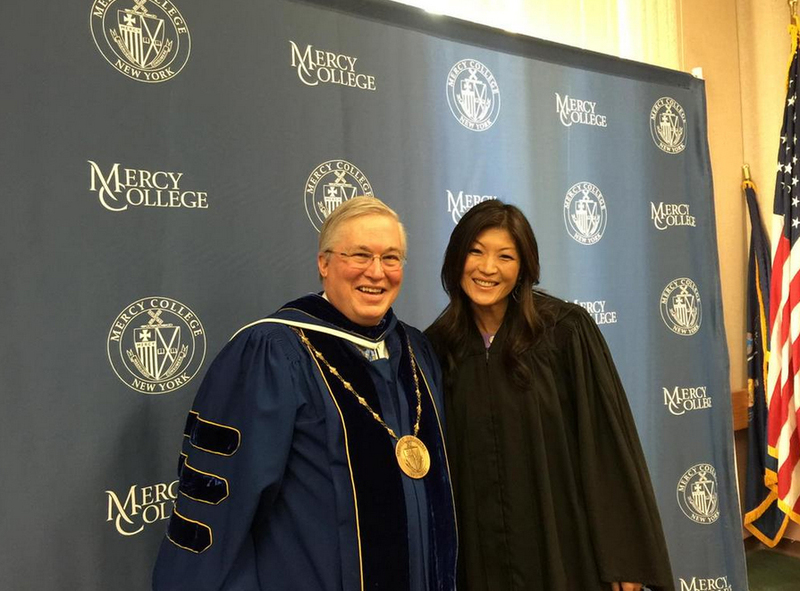 I leave you with a shot from before the School of Liberal Arts and School of Social and Behavioral Science Commencement of our president Tim Hall with the keynote speaker JuJu Chang from ABC news. You can see a brief video she uploaded from the stage at the end of the ceremony on her Instagram account (it’s dated May 20, 2015). 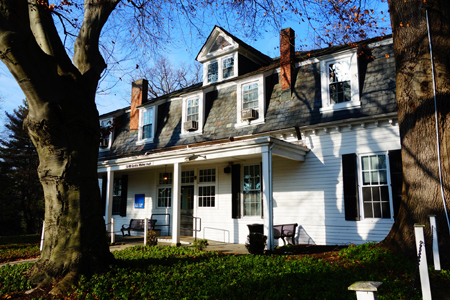 The Pace University Department of English and Modern Language Studies, in Pleasantville, New York, has a number of adjunct faculty positions available for the 2015-2016 academic year, which begins September 2, 2015. Successful candidates will teach freshman or sophomore-level composition courses, and will be mentored by the Director and Associate Director of Composition. A Master of Arts in English is required; familiarity with composition and rhetoric pedagogy preferred. Interested candidates may direct questions and application materials to Professor Andrew Stout, Associate Director of Composition, via email: astout@pace.edu. A complete application will include a cover letter and CV in one PDF document. The deadline for applications is June 1, 2015. Let me know at cloots@mercy.edu if you need any help or advice about putting together your CV or application, for Pace or for any teaching opportunity. I’m happy to review anyone’s CV and give you some pointers. You should note that all of us begin as adjuncts (part-time professor). Every professor you’ve ever had started at some point as an adjunct/part-time prof.